What do childhood cancer patients and Navy SEALs have in common? Resilience? Grit? Tenacity? A sum of all these traits unifies our like-minded warriors in a special and transformational companionship. Although the battlefields for these big and little warriors may differ, the heroism and perseverance remain the same. Pediatric cancer is a uniquely devastating war because the battlefield is over the body of a child. It is undoubtedly an unfair fight. However, in bringing these two warriors together we are able to even the odds in the fight against childhood cancer and provide impactful relationships that our heroes can lean on for strength and support. Connor’s Navy SEAL mentor, Jimmy, is no stranger to physical limitations. Jimmy was critically wounded on a Navy SEAL mission to rescue Bowe Bergdahl, a U.S. Soldier who deserted his platoon and was held captive by the Taliban. Without hesitation, Jimmy risked his own life in an attempt to rescue Bergdahl who voluntarily deserted his fellow American soldiers in Afghanistan. Jimmy’s injury during this mission ended his 22-year career as a Navy SEAL. He was shot just above the knee which essentially shattered his femur. Jimmy is lucky to be alive and attributes this to his teammates and the K9’s he worked with, including Remco, who was killed in action while saving Jimmy’s life on the night he was wounded. Upon returning home from Afghanistan, a different battle emerged in Jimmy. His injury coupled with reintegration back home led him to a dark and depressed period in his life, as he describes in his interview with Anderson Cooper. He contemplated suicide whilst grappling with the traumatic events that led to the end of his Navy SEAL career. Eventually, Jimmy found refuge in continuing to serve a purpose greater than himself through embracing opportunities to volunteer and help others. Most notably, Jimmy is the Founder of Spike’s K9 Fund, a nonprofit organization dedicated to helping working dogs. He founded this organization in honor of Remco, Spike, and all of the K9’s he went to war with. He says: “I wouldn’t be here and neither would some of the other guys if it wasn’t for those dogs. They totally saved us.” Jimmy’s passion for helping others brought him to join One Summit’s mentorship program. He demonstrates to his mentee the power of a never-give-up mindset and taught him to persevere in the face of challenges and uncertainty. During our Climb for Courage, Connor and Jimmy formed an unbreakable bond that they both rely on. Long after the conclusion of the event, Connor continues to lean on the Climb for Courage and Jimmy for the strength to fight cancer. As Connor’s mom states: “My son talks about you guys all the time. He’s still fighting and things have been really tough. He keeps referring to how hard it was to climb the rock wall, but he did it! He said today, “Mom where’s my dog tags? I need them. They remind me how I climbed that wall. It was so hard but I did it!“ Connor and Jimmy share a ferocious sense of determination and constantly remind us to never give up, regardless of the individual war you’re fighting. The heroism and inner strength both of these extraordinary individuals’ possess are deeply inspiring. 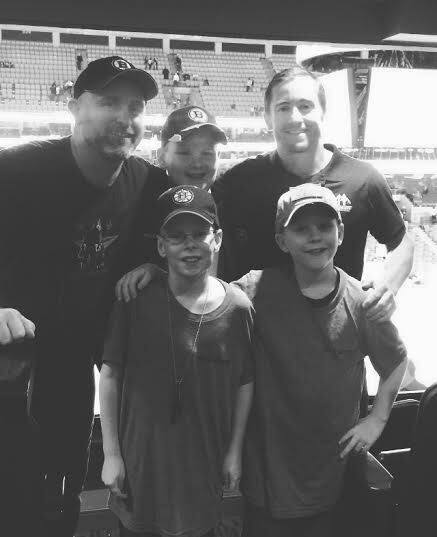 They continue to stay in touch over email and attended a Bruins game together last winter. Connor draws on his acquired skills and companionship to face cancer head on, defying the odds, he continues to amaze us all.